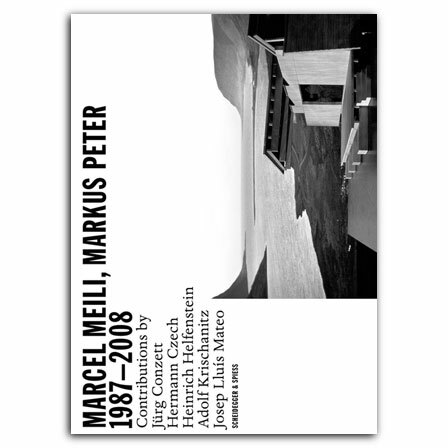 Marcel Meili (*1953) and Markus Peter (*1957) are two of the leading architects in Switzerland, and this book is the first comprehensive monograph on the works of their architectural firm, Meili Peter Architects. Urban planning and complex constructive solutions are at the heart of every Meili Peter project, and this volume presents the numerous buildings created by the pair, as well as unrealized projects, concepts, and ideas. Text, images, plans, and drawings are featured for each building, including the Helvetia Patria insurance headquarters in Milan; Swiss Re’s Center for Global Dialogue in Rüschlikon; the Park Hyatt Zürich; the Swiss College of Timber Industry in Biel/Bienne; and the masterplan and headquarters for Süddeutscher Verlag in Munich. Essays by renowned architects—including Jürg Conzett from Switzerland, Hermann Czech and Adolf Krischanitz from Austria, and Josep Lluís Mateo from Spain—discuss the aesthetic philosophy and impact of Meili Peter buildings. Marcel Meili, Markus Peter1987–2008 received an award from Stiftung Buchkunst in the 2008 competition Most Beautiful Books from Germany. It was also a nominee for the 2009 German Design Award. , dipl. Bauingenieur ETH/SIA (born 1956). Studied civil engineering at EPF Lausanne and ETH Zurich. Diploma in 1980. Worked with Peter Zumthor. Since 1988: own engineering office in Chur (Conzett Bronzini Partner). Major projects: Punt da Suransuns, Traversiner Footbridge.